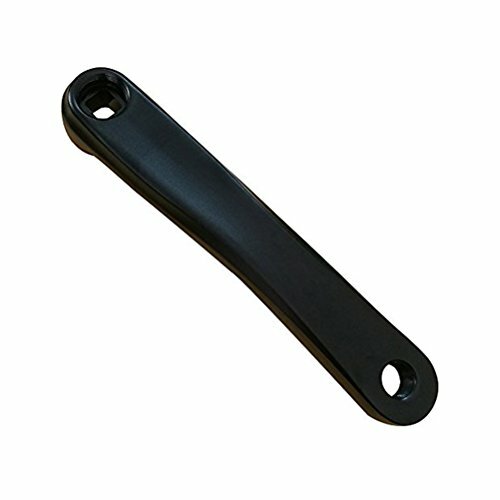 WINOMO Bike Left Crank Arm 170mm Horizontal Square (Black) by WINOMO at Melon City Bike Club. MPN: 43224-13522. Hurry! Limited time offer. Offer valid only while supplies last. DescriptionThis item is manufactured with premium aluminum alloy for durable and long lasting use. The center distance between two holes is 170mm. This item is manufactured with premium aluminum alloy for durable and long lasting use. The center distance between two holes is 170mm. Suitable for road bike, mountain bike, folding bike, fixed gear bicycle, etc. Great bike accessory that can provide you help in most situation. - Size: About 21 x 2 x 1cm/8.3 x 0.8 x 0.4inch(LxWxH). Constructed with premium aluminum alloy, the crank arm is durable and strong. The center distance between two holes is 170mm. Spindle Interface Type: Horizontal Square Taper. Please check if the orientation of your right crank arm is square or diamond. Keep both left and right arms having the same hole. Suitable for road bike, mountain bike, folding bike, fixed gear bicycle, etc. Size: About 21 x 2 x 1cm/8.3 x 0.8 x 0.4inch(LxWxH).